Christina contacted me in July after getting engaged in June. 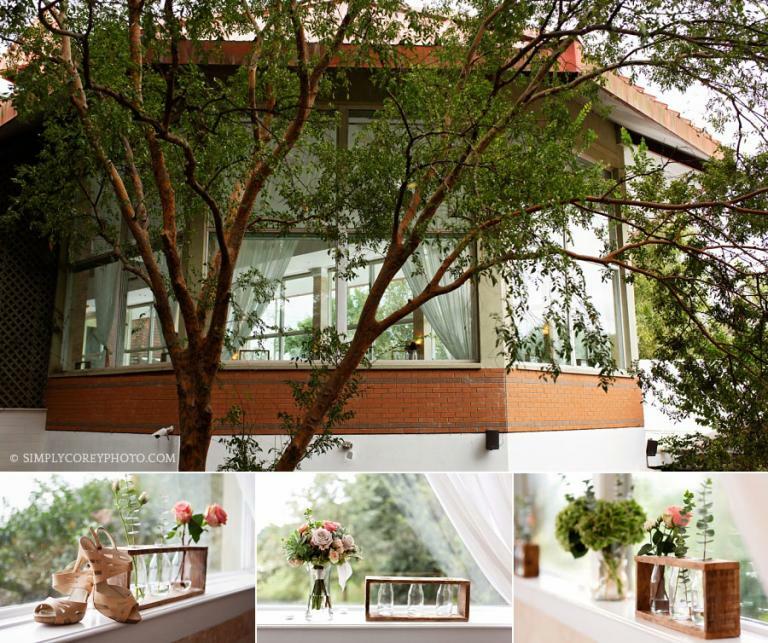 What started as plans to elope ended up being an intimate, mid-week celebration at Park Tavern … just four months later! Neil and Christina used to live in Atlanta, not far from Piedmont Park. Even though they have since moved out west, Atlanta still has a large piece of their hearts. 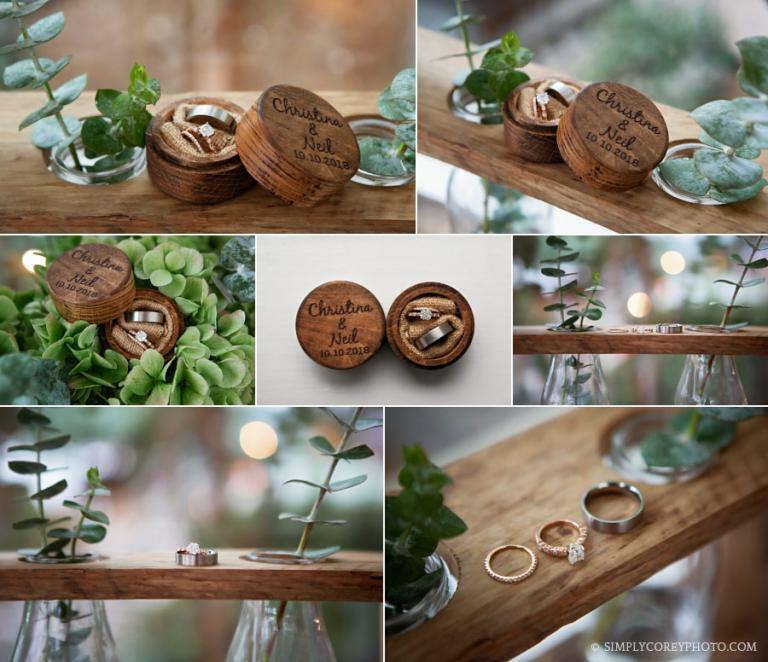 I adored the wooden ring box that Christina and Neil had for their wedding rings. Personalized keepsakes are some of my favorite details! The little paper airplane was a note from Christina to Neil right before she walked down the aisle to him. He’s a pilot and I thought that was so perfect! Her succulent bouquet also made my heart happy! We snuck a few photos of the cake before the table was ready, but that light was too perfect to pass up! Christina wanted to put her dress on downstairs near the fireplace and I loved the moody light down there! Then it was back upstairs to finish getting ready … and hug a few necks before the ceremony started! Neil’s blue suit was awesome and the succulent boutonniere went perfectly! Their vows were handwritten and heartfelt. It was so sweet hearing them read them to each other – and even I got a little teary-eyed! We may not have been able to drive around Piedmont Park in a golf cart like they wanted, but we made the best of the Piedmont Room after their ceremony. I think their photos together turned out beautifully! The sitting area with furniture from Red Door was absolutely perfect! Their guests were tucked away enjoying some cocktails and they were able to have some time alone. I love the pilot and co-pliot signs on the backs of their chairs. They sat in those later during the toasts! They were both full of expressions during the toasts! One of my favorite parts of their reception! This bride and groom didn’t have an official first dance, but this was pretty close. I love capturing sweet moments like these! Grandma was my favorite though! She kissed me on my cheek when I told her she was showing everyone else how it was done! Ha! And then she went on to dance some more! Toward the end of the reception, the bride and groom drank out of their new personalized boots! A wedding gift from the groom’s brother! And then a little more dancing before it was time for the night to end! Simply Corey Photography is located west of Atlanta, near Newnan, Carrollton, Douglasville, Villa Rica, and Bremen. I opened my photography business in late 2004 and have photographed many couples, weddings, and events throughout the metro Atlanta area since. I am available for weddings, elopements, and portrait sessions Sunday through Friday. Engagement and anniversary sessions may take place at my private outdoor location or the location of your choice within greater Atlanta. I have put together some information for weddings and portrait sessions with Simply Corey Photography, and each link provides examples of my work, what to expect, and starting rates. You may request detailed pricing and my availability by sending me an email! I would also love for you to connect with Simply Corey Photography on Facebook and Instagram! What to wear inspiration and a variety of wedding ideas can be found on the Simply Corey Photography Pinterest boards.